My sister mentioned orange sherbet in an email a few days ago. Whenever I see or hear the word "sherbet," I hear my father's voice correcting me. He would say, "It's SHERBET, not sherbert." I continued to say "sherbert." In doing a search about these words just now, I discovered the "Books Ngram Viewer" take on sherbet vs sherbert, which led me to type in "mother, mom," just out of curiosity. Which reminded me again of something my mother used to say that I heard as, "Wouldn't that just corn ya?" It was something that she would say while shaking her head in wonder and smiling wryly. 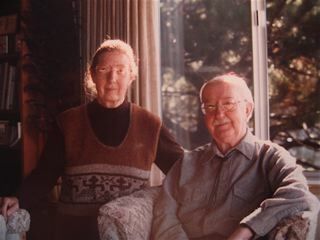 That's a photo I took of my mother and my father, probably in the early 1990s. My mother died in December 1994. Thinking of her today. She would have loved the Books Ngram Viewer and blogs and Google Maps and YouTube and all. I'd love to hear her say, "Wouldn't that just corn ya?" I've never heard that saying, but now will be using it every chance I get. It's fantastic! I got the same lesson on the frozen dessert item -- and the other big one is the correct use of "lie" vs. "lay" and of course everybody gets that one wrong.